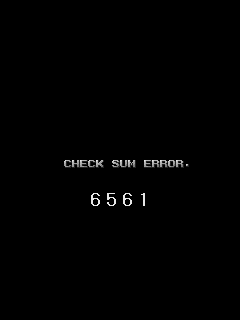 Post subject: Raiden Fighters 2 arcade board "checksum error 6561"
I have a Raiden Fighters 2 Seibu SPI board. When it boots, I get a 'checksum error 6561' error. Any idea how to fix this, or what's wrong? It seems it might be a region issue. I checked the last byte of the PRG0 ROM, and it was the Japanese version code. I changed this to 10 for the US, and the error message changed to English, but nothing else changed. I tried both settings on JP121 jumper (the 'update' jumper). Last edited by hackbar on Wed Jun 06, 2018 11:59 pm, edited 1 time in total. Hmm, embedding right from Google Photos didn't work. Fixed, I think. Ok, now the photos are fixed. Have you got a complete dump of the cart you can share ? Also did this cart ever work or did you buy it untested ? I've never seen the board nor cart work. I just bought it untested. I don't have another Seibu board to test. I dumped the 4 prg roms, and they matched the MAME rdft2j set. Are the other roms included in the checksum? I swapped the last byte in PRG0 to the US byte (0x10 I think). I did notice the actual US set on MAME was different. Is that due to English text? Should what I did work? The checksum error means that your cart region is not the same as the motherboard. Your motherboard looks like it came from asia. Nope, same behavior with 0x22. Is the checksum error really a region error? There's no way it's a bad ROM? What all ROMs are in the checksum? Anyway, I doubt any of this applies to these checksum errors, I just wanted to rant a bit. I also was initially confused when my PVM showed 576i and displayed the games with huge black borders on all sides, but then I remembered that some arcade games have weird refresh rates, and sure enough the Seibu games use 54 or 55hz or something like that, which I assume makes my PVM think it's receiving a PAL signal, and it adds borders to make up for the difference in resolution between NTSC and PAL. But no big deal as I can just hit the Overscan button to zoom in. 0x24 gives the same error. Should I just try every region? The cartridge is keyed, so I'm not putting it in backwards. Even if the top cover was on wrong, you can't insert it backwards. 0x24 gives the same error. Should I just try every region?. We know that your cart is most likely working so, yeah you have to try the regions. The sticker on your motherboard reminds of the stickers Excellent.com would put on their PCBs. I tried all the regions MAME knows about, and they all give the same error (although the japanese one has japanese text). This is correct, right? There's not anything else I need to do? Try region 0x00 and 0xff as well. If you have the tools you could desolder the FLASH chip and take a look at the byte ? I don't have the tools to desolder it, but I know people who can. Which chip? Desolder u1053, look at the first byte. What's up with that? Is it a pirate thing? That' not listed as a legion in MAME. Nice work, please snap a picture of the title screen and share it here. Where it says licensed to. Well, now I have a separate problem. The game boots and plays the rippin music, but complains that the JP1 jumper is wrong, or on a newer board like mine, 12v is bad. I checked 12v and it's fine. What's it looking for? Bad flash chip? I put a picture in https://photos.app.goo.gl/4x8WjlCluYs1Ojo22 . The jumper on the motherboard you have: SSXD 2.1 only selects between MONO and STEREO. On the SSXD 2.1 there is no programming jumper. The software i.e. the program ROMs might be too old for this motherboard so it does not recognize the SSXD 2.1 PCB. Maybe try burning the newest version from MAME into PRG 0,1,2,3 and changing the region byte ? What is the newest version? Do you have the hashes, or a link to the ROM_START block in MAME code? That's "rdft2", which is what I flashed. It's the same as "rdft2j", but with the region byte changed. Also the error message specifically mentions SXX2D, which is the rev board I have. Last edited by hackbar on Sun Jun 17, 2018 10:54 pm, edited 1 time in total. It looks like your motherboard is defective. I would try to find someone close to you which also has an SPI setup and try your cart on their motherboard. And then try one of their carts on your motherboard to rule out where the problem lies. Also inspect the PCB for any broken tracks or damage. Did you measure your 12V when the game was connected ? I did a test on MAME last night and region 0 results in "SAMPLE VERSION" shown as the region. Last edited by rtw on Tue Jun 19, 2018 11:25 pm, edited 1 time in total. 12v is fine. Where are the schematics for this board? Also, what is the significance of region 0? What is it used for? I'm suspicious of the flash chip on my board. If it's defective and reading all 0s, this would match the region 0 cart. I'm guessing it would also fail to flash in this situation? If the FLASH is bad it will contain 0xff after an erase. What does SAMPLE VERSION mean? Most likely it was given out to distributors to be displayed at trade shows etc. Or the version had only a few levels used on a location test, that sort of thing. I fixed the board, it was a bad flash chip. That makes sense - the bad chip read 0x00 as a region code, and wouldn't let the board be flashed.